Hurricane Preparedness Week: The Deadly Threat of Inland Flooding & Intense Winds. Hurricane hazards come in many forms, including storm surge, heavy rainfall, inland flooding, high winds, tornadoes, and rip currents. Gaining a better understanding of tropical cyclones and hurricane hazards will help to make a more informed decision on your risk and what actions to take. Today we’re talking about high wind and inland flooding two incredibly deadly and destructive elements of hurricanes. Read, watch and share! When these powerful storms move over land, they lose wind strength but continue to dump massive amounts of rain into streams, rivers and lakes, posing a serious threat of inland flooding. 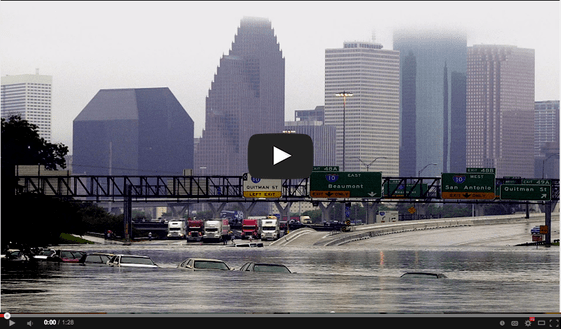 These floods account for more than 50 percent of hurricane-related deaths each year. Watch this short and shareable video of National Hurricane Center (NHC) Hurricane Specialist John Cangialosi discussing the deadly danger of inland flooding caused by tropical cyclones and hurricanes. 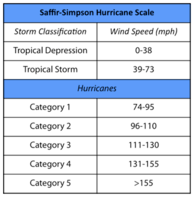 The Saffir-Simpson Hurricane Wind Scale is a 1 to 5 rating based on a hurricane’s sustained wind speed. This scale estimates potential property damage. Hurricanes reaching Category 3 and higher are considered major hurricanes because of their potential for significant loss of life and damage. Category 1 and 2 storms are still dangerous, however, and require preventative measures. In the western North Pacific, the term “super typhoon” is used for tropical cyclones with sustained winds exceeding 150 mph. Don’t have it yet? Download the Hurricane Preparedness Toolkit and start spreading the word about #HurricanePrep.